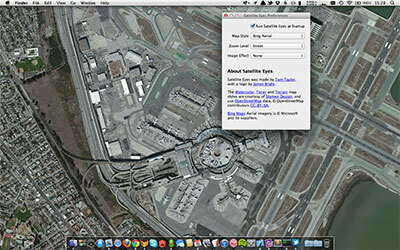 Satellite Eyes is a MacOS app that automatically changes your desktop wallpaper to the satellite view of where you are, right now. Pull your laptop out somewhere new, and your desktop will automatically change to the view from overhead. It has a number of different map styles, ranging from aerial photography to abstract watercolors. And if you have multiple monitors, it will take advantage of the full width, spanning images across them. Oh, and it's free. And the source code is available on Github. Satellite Eyes was made by Tom Taylor, with maps courtesy of Stamen Design, MapBox, Thunderforest and Bing Maps. Why is Satellite Eyes is "waiting for a location fix"? Satellite Eyes relies on OS X's Location Services, which uses Apple's database of Wi-Fi access points to triangulate your position. To get a fix you'll need Wi-Fi enabled on your machine, and a working internet connection. If none of the nearby access points are in the database, or if Location Services can't communicate with Apple's database over the internet, Satellite Eyes won't be able to find your position. The database of WiFi access point locations is managed by Apple, and to the best of my knowledge, there's no way to add them manually. How do I remove Satellite Eyes completely? With the application running, open the preferences, and untick "Run Satellite Eyes at Startup". Then, delete the application from wherever you installed it; probably your Applications folder.